Sé de Lisboa by Night.. The roots of Lisbon go back centuries. It was a bishopric of the nascent Catholic Church as far back as the 4th century. But unlike many European cities, the history of Lisbon took an odd turn in the 8th century. It was conquered by Muslim invaders and the Moorish occupation lasted for nearly 400 years. The result for the modern traveler is that even such a common building as a cathedral takes on a somewhat different cast in this Portuguese city. The Sé de Lisboa, or the Santa Maria Maior de Lisboa, is just such an example. After the first King of Portugal, Alfonso Henriques with help from the English, drove the Moors out of Lisbon in 1147, he began an ambitious building program. 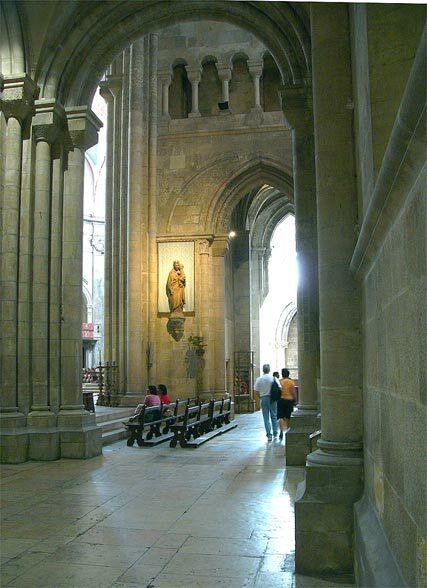 One of the first was the Lisbon Cathedral, as it has come to be known. Like most from the Medieval period, the project continued for nearly the next 300 years. As a result, the building displays many styles, as changes were made during the effort. The cathedral facade is relatively plain, a utilitarian set of walls that appear to the visitor like a fortress. But the interior contains many splendours. The chapel in the cloister, for example, holds architectural details that will delight anyone who enjoys cathedrals. Here one can see evidence of Lisbon’s Roman and Arab periods in the excavated central courtyard. Built with the standard Latin cross plan, there are three aisles, a transept and a main chapel. The cloister is connected to the church on the east end. Standing in the centre one can look up in the direction of the entrance at an impressive rose window. As you do, you can easily observe the high barrel vaults that were the main innovation of medieval churches adapted from the Romans. The other rose windows admit the warm Lisbon sunshine to illuminate them with a gentle glow. Walk to the ambulatory and spend some time admiring the Gothic tomb of Lopo Fernandes Pacheco, an heroic knight in the service of King Alfonso IV. Beside his is that of his wife, Maria Vilalobos, who is depicted reading a Book of Hours. Alfonso was once buried in the main chapel, but the tombs were destroyed in the famed 1755 earthquake that devastated much of Lisbon. Near the entrance is another surviving tomb, this one of a rich merchant named Bartolomeu Joanes. Construction has continued off and on right up to the present. In the 18th century, after the earthquake, the main chapel was rebuilt in the Rococo style of the day. One evidence of this is the crib in Joanes’s chapel. While no one would claim that Lisbon Cathedral is the equal of Notre-Dame in Paris, its rich history – as seen throughout the building – definitely merits a visit from the Lisbon tourist. 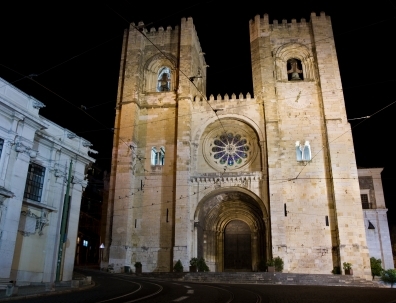 The cathedral is in the Alfama district and is easy to reach by taking tram or bus.